This question is posed to us from time to time by young women who are considering the possibility of becoming a religious sister. or a call to live out a religious vocation as a priest or religious brother or sister. A vocation is a call by God to a particular state in life. For God tells us in Jeremiah 1:5, “Before I formed you in the womb I knew you, before you were born I dedicated you, a prophet to the nations I appointed you.” And again in Jeremiah 29:11, “I know well the plans I have in mind for you, says the LORD, plans for your welfare, not for woe! plans to give you a future full of hope.” This is good news! We have a God who has loved us in to being and wants us to be happy! In fact, He “alone probes the mind and tests the heart” (Jer. 17:10). Knowing what will make us supremely happy - not the fleeting happiness of emotions, but the peace and joy that He alone can give – He calls each one to the very vocation we are best suited to. 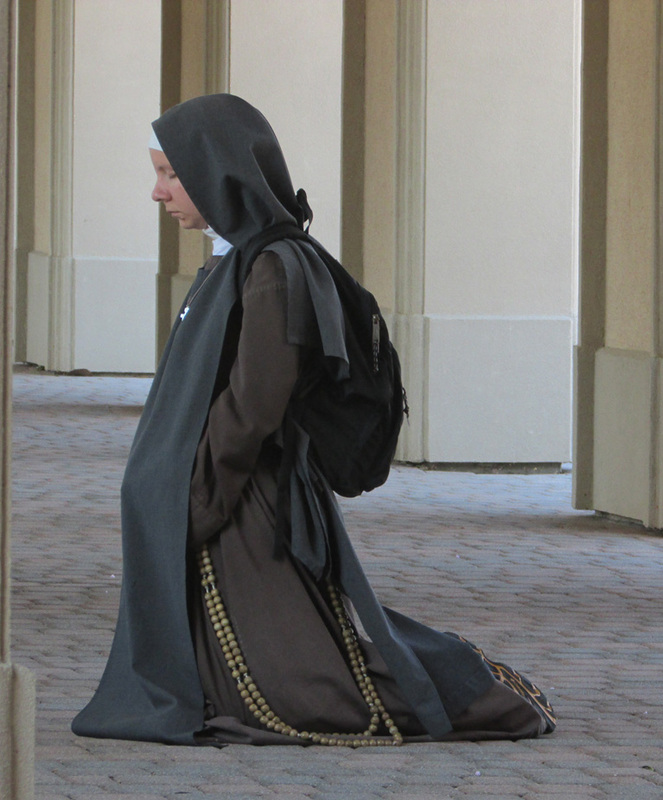 A religious vocation, whether to the priesthood or religious life, is also a call to love. There is a certain spousal aspect to this love as well, Our Lord being the “Other” in this relationship. Every human person is called to union with God, but in a special way one with a religious vocation Frees him/herself to offer everything that they are and have, freeing themselves from the obstacles which could hinder the totality of their response. In this way they will become true signs of Christ in the world” (Vita Consecrata #25). This dedication and love for God is lived in a Total gift of self to Him, giving oneself generously, “for the sake of the Kingdom of Heaven” (Matthew 19:12). A religious is Faithful to God exclusively in perfect continence with a love that is, “a manifestation of dedication to God with ‘an undivided heart’ (1 Cor. 7:32-34)…the love to which the Incarnate Word bears witness even to the point of giving his life” (Vita Consecrata #21). The Fruitfulness of the religious, “lies in the fact that all are called to become saints which cannot fail to inspire more and more those who by their very choice of life have the mission of reminding others of that call” (Vita Consecrata #39). 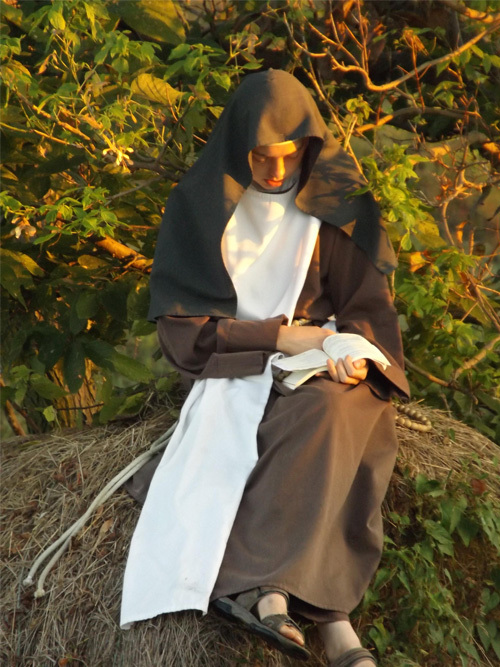 The vocation to remain single in the world is also a call to, “love the Lord, your God, with all your heart, with all your soul, and with all your mind” (Mt 22:37) “An unmarried man is anxious about the things of the Lord, how he may please the Lord… An unmarried woman or a virgin is anxious about the things of the Lord, so that she may be holy in both body and spirit” ( 1Cor 7:32-34). For someone who is asking the question, “to what vocation am I called?” what is needed is an openness to doing God’s Will in their lives. A person set on this intention, growing each day closer to the Lord through participation in a sacramental life and daily prayer (especially prayer before Our Lord Jesus Christ, Truly & Substantially Present in the Blessed Sacrament) will be led by Him to the perfect vocation which will give them ultimate fulfillment. As we are contemplatives in action, our life and work is possible only through deep prayer, both in community and individually. Our sisters attend daily Mass and participate in Matins, Lauds, Sext, Vespers and Compline as a community in union with the Universal Church. We also pray the Rosary and the Divine Mercy Chaplet daily. Individually, each sister has one hour of Eucharistic Adoration, Spiritual Reading, and private prayer each day. -to love rather than be loved. In the Spirit of Saint Francis, each should be an instrument of God's peace, sowing love where there is hatred, pardon where there is injury, faith where there is doubt, hope where there is despair, light where there is darkness, and joy where there is sadness. Each Daughter should be ready to console rather than be consoled, to comfort rather than be comforted, to understand rather that be understood. This allows each Daughter to serve God freely with an open heart and soul. Obedience signifies our desire to respond like Christ to the Father's Will; He who was obedient even unto death. 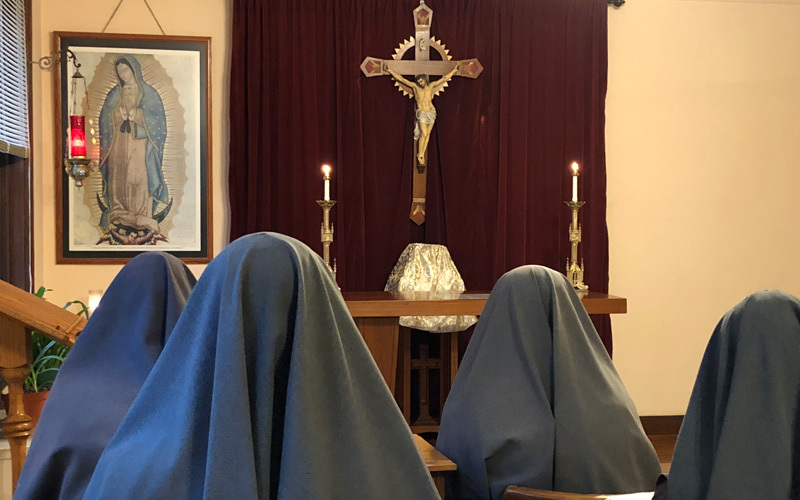 The goal of formation for Postulants is to discern whether or not they are truly called by God to serve in a religious association, particularly this one. Postulancy is a period of discernment that lasts from 6 months to one year depending on the readiness of the candidate to advance to the level of Novice. Duration may be extended for up to one year. If at any time during Postulancy the candidate decides that our way of life is not for her, she is free to leave. Conversely, if the Counsel decides that the candidate is not suited to our way of life, she may be asked to leave. 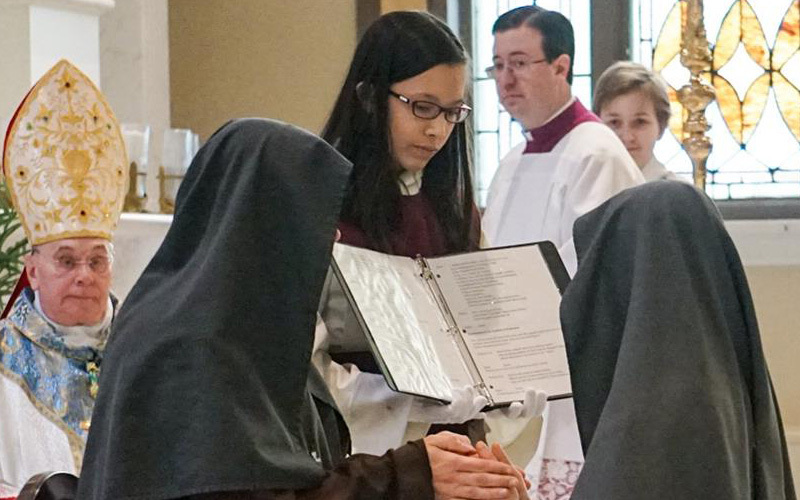 Following Novitiate, the sisters make their First Profession of Vows. Our sisters profess the Evangelical Counsels with a 4th Vow to uphold the Dignity of every human person from the moment of conception until natural death for one year. This may be renewed for another year and then for a period of three years. 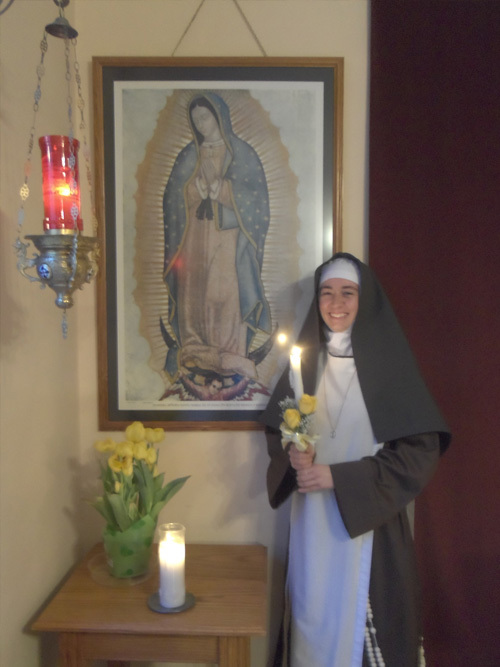 After five years of temporary Vows, she is eligible for Perpetual Profession. After five years of temporary profession, she is eligible for perpetual profession. Religious life brings together disciples of Christ, who can only bear fruit if they are motivated by a profound continual spiritual renewal. The aim is that each daughter realizes that in giving her life to the service of the Lord, she belongs to Him alone. Spiritual development is fostered among all professed members so that they never lose sight of the spiritual component of their lives. Individual and community retreats are to be taken on a yearly basis. 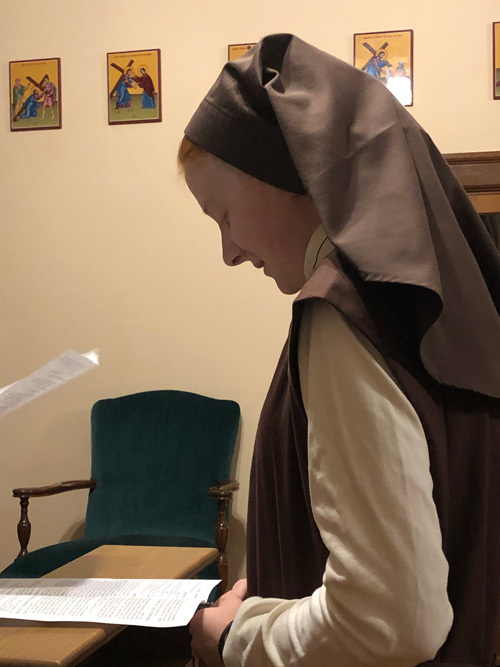 To deepen our relationship with Our Lord Jesus Christ, all professed daughters are encouraged in spiritual reading, prayer and contemplation, spiritual activities and “prayer in action” within the apostolate. For Your love is better than life." and you will have a treasure in heaven. Then come, follow Me. in ways that are level and smooth." for ever singin Your praise. so shall your God rejoice in you." "The virgin - indeed, any unmarried woman... is concerned with things of the Lord, in pursuit of holiness in body and spirit." He is your Lord, pay homage to Him." Bend my heart to Your Will." when He pours gifts on His beloved while they slumber." my Shield, my place of refuge." "A great sign appeared in the sky, a woman clothed with the sun, with the moon under her feet, and on her head a crown of twelve stars." Of this I am sure, that Your love lasts forever." "Conduct yourselves in a way worthy of the gospel of Christ, so that, whether I come and see you or am absent, I may hear news of you, that you are standing firm in one spirit, with one mind struggling together for the faith of the gospel." Be still before the LORD and wait in patience." for You, O LORD, are my God"
"When you come to serve the Lord, prepare yourself for trials."